Calves, Hurricane Evacuations and Life Updates! Hey there! Sorry I went missing from the blog for a couple of days but things have been hectic here. If we’re friends on Instagram (@KristinaRunning) you’ve seen my daily Story updates. I’ve been trying to stay in touch with everywhere there and on FB if we’re friends. 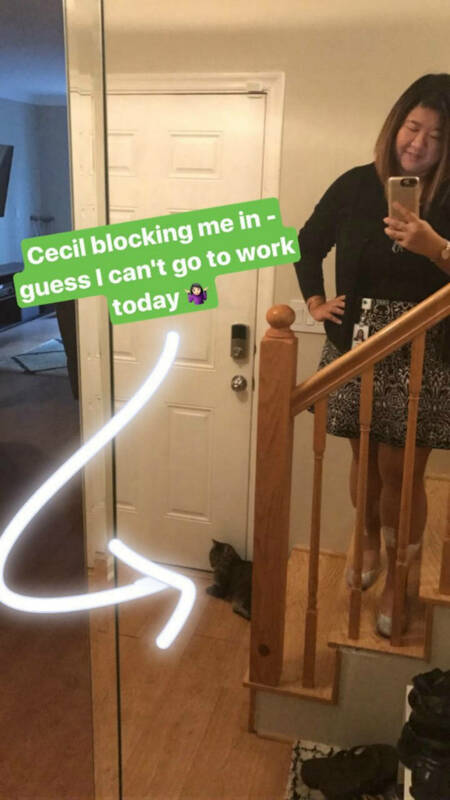 Here’s a quick rundown for everyone else: my legs are healing well, I’m increasingly worried about the hurricane, the new job is great and Cecil is still very cute :). Prior to going back to work all of the swelling in my legs and feet had completely gone away, probably because I was able to keep them elevated a lot at home. I started my new job on Tuesday and the swelling has come back. In fact I don’t think I’ve ever had such bad swelling before in my life. Last night I put my “loosest” pair of compression socks and I barely got them on. 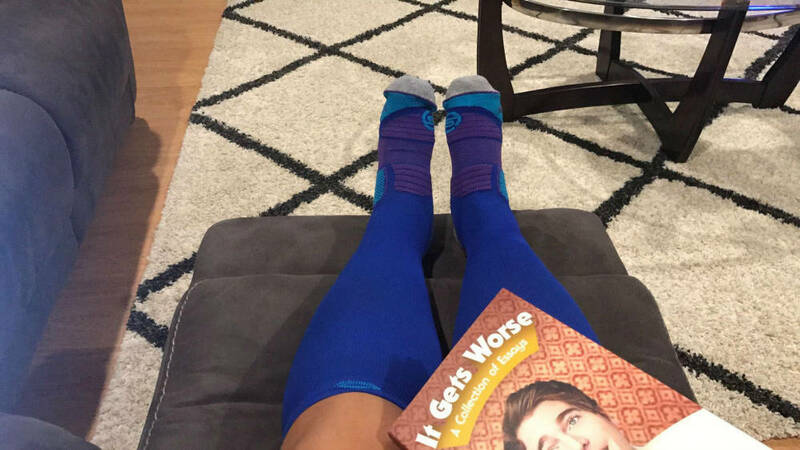 It was a real struggle and they are super tight, Getting them on was a process because my shins and calves are both really sensitive at this point, but once I got them on everything felt better. Ali had a fasciotomy for exertional compartment syndrome last week as well and is experiencing all of the same symptoms. It’s so nice to know someone else who is going through the same thing at the same time to compare notes! Since we’re both Floridians we’re also both preparing for Hurricane Irma. Since I’m the new girl at work I haven’t been able to take any time off so far. Luckily Adam has had a few days off and has been able to prep the house while I’m in the office. Our home is in a mandatory evacuation zone so we’ll be leaving soon. We’re mostly all boarded up now. Adam put up all the hurricane shutters except for the one door that you see in the header photo here on this post. Those shutters will go up today. 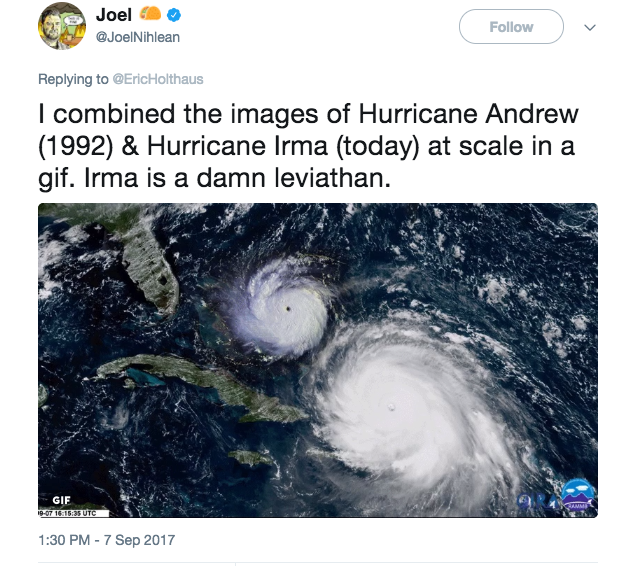 South Florida is known for having survived Hurricane Andrew, another category 5 storm, but Irma is a totally different monster. Currently here in coastal Broward county we are expecting gusts of up to 155mph, with sustained winds in the 120mph range. Luckily, Adam’s parents live further inland where winds are expected to be a bit tamer: 95 to 115mph. We’ll be staying with them for as long as necessary. I hope we don’t lose power but I feel like that’s a futile wish. I should amend it to say I hope we don’t lose power for too long. FPL put out a statement saying if we get a direct hit we can expect weeks without power because even the strongest grid is only able to withstand winds up to 145mph. Plus, if houses go down, power can’t be restored to any homes within its grid until the fallen house has been inspected and deemed safe. GULP. After hurricane Wilma in 2005 many homes in the coastal region were without power for about 2 weeks. I was still living in Orlando then, but Adam had already moved back to South Florida. He came to stay with me after the storm because power was out for so long. It’s hard to believe that was so long ago now. I remember driving him home and seeing trees down everywhere, weeks after the storm had passed. I’m looking forward to everything being back to normal and nothing has even happened yet. 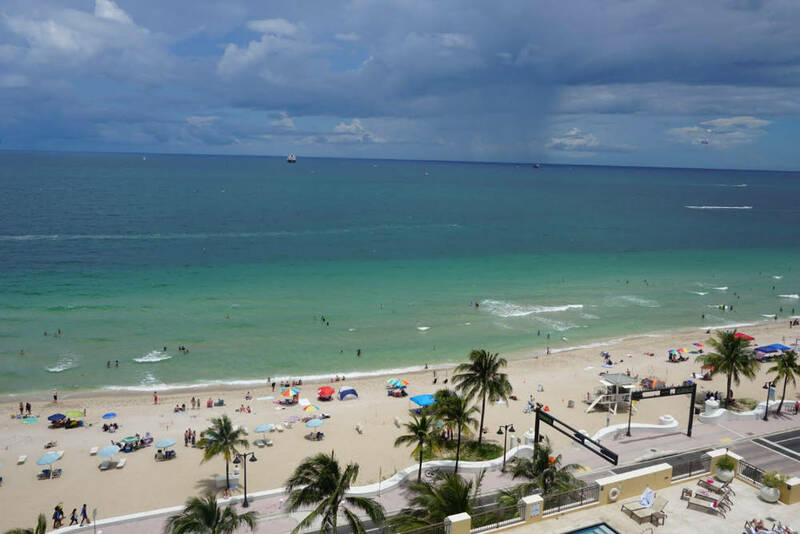 I love Fort Lauderdale so much. Cecil knows something is wrong – probably because we brought all the patio furniture and the grill into the living room! I’ll be packing him a little suitcase tomorrow and then we’ll all be off. I’ll be updating my Instagram Story as often as possible if you’d like to stay in touch. Hopefully the storm will veer off course and I’ll be back with a blog post on Monday. If not I’ll talk to you again as soon as possible. To my fellow Floridians – stay safe and I wish you the best! A Running Milestone + Look at This! Previous Post Exercise Benchmark Has Been Set! Man you have so much going on right now. I am so sorry and can’t even imagine what it would be like to pack up and leave my house, not knowing when we’d be back or if my house would be okay. I have been thinking about you and Ali nonstop!! On a totally unserious note… I love your skirt! Sam @ G & G Nutrition Co.
Are you supposed to be icing your legs? I used an ice machine (I bought it off of craigslist) and it was AMAZING compared to ice packs. It may not matter in the midst of a hurricane, though. Stay safe! Please be safe, my friend! You are all in my thoughts and prayers and I just hope the storm loses some force before it hits. What it has done so far is truly heartbreaking…. Stay safe!! We are all thinking of all of you in Florida. Roger’s family lives in Miami Dade county, and they are refusing to evacuate, so stress levels at my house are at an all time high right now. Stay safe–and take care of yourself. Stay safe! It is so scary to read about how bad this storm could be. Im praying for the best case scenario. I’ve been thinking about you! Hope you fared OK through the storm and are safe and sound! I love the outfit for work!! I had to go back and read this just so I can catch up 🙂 I am glad you made it through the storm okay. Its not my first time to visit this site, i am browsing this site dailly and get good facts from here daily.